I’m not sure how storyline-correct this version of Xantcha is. She joined Urza’s crusade because she was defective from the Phyrexian point of view, and never actually operated as a sleeper agent. Still, it’s great to see her again and she has an interesting role in multiplayer formats. Her stats recall the infamous Phyrexian Negator, and you can send her to an opponent’s side to (ideally!) work together against a third, more powerful opponent. And if they don’t have a way to stop you from using her ability to draw cards and damage them, all the better for you. I’d stick mainly to using her in multiplayer settings; while using her in a 1v1 scenario means that she’ll never be able to attack at all, there are other ways for black and red to draw cards repeatedly that may be better positioned for such matches. 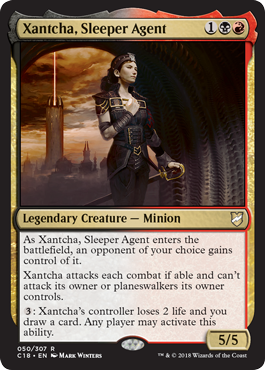 Xantcha has appeared on cards before (Sleeper Agent), but this is the first time she’s been called out by name in the name of a card. She was part of the Weatherlight saga, a Phyrexian gone rogue (as evidenced by the Minion creature type). And, like the original, she moves to an opponent when she comes into play. This time, though, Xantcha is far more beneficial to you. Pass control to an opponent; while she is powerful, she also must attack and can be forced into attacking undesirable targets. She also can’t attack you, which makes her especially effective in a multiplayer setting. The last ability of hers is probably the best one, a steady stream of card draw at the expense of its controller. Everyone can benefit (even her controller), but some benefit more than others. She’s a fun, political card for Commander who can play well in a solid shell. She doesn’t help you not lose (unless you’re flooded on mana and need a lot of cards), but she can help get you ahead while your opponents fight amongst themselves.